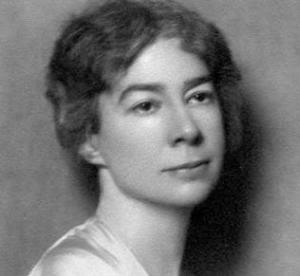 Sara Teasdale (August 8, 1884 – January 29, 1933), was an American lyrical poet. She was born Sara Trevor Teasdale in St. Louis, Missouri, and after her marriage in 1914 she went by the name Sara Teasdale Filsinger. Teasdale’s first poem was published in Reedy’s Mirror, a local newspaper, in 1907. Her first collection of poems, Sonnets to Duse and Other Poems, was published that same year. Teasdale’s second collection of poems, Helen of Troy and Other Poems, was published in 1911. It was well received by critics, who praised its lyrical mastery and romantic subject matter. Teasdale’s third poetry collection, Rivers to the Sea, was published in 1915 and was a best seller, being reprinted several times. A year later, in 1916 she moved to New York City with Filsinger, where they resided in an Upper West Side apartment on Central Park West. In 1918, her poetry collection Love Songs (released 1917) won three awards: the Columbia University Poetry Society prize, the 1918 Pulitzer Prize for poetry and the annual prize of the Poetry Society of America.